Situated in the heart of North Northumberland, just off the main A1 road, halfway between Alnwick and Berwick upon Tweed, and just 5 miles from the spectacular beaches at Bamburgh, Bluebell Farm offers a range of self catering holiday options: the Caravan Park has bases for 40 static caravans and 20 seasonal touring caravans, with a small area for tents and occasional touring units. We also have a Bunkbarn, offering hostel style accommodation with a self contained Studio annexe, and 5 self catering cottages, giving a wide range of choice for self catering holidays in North Northumberland. 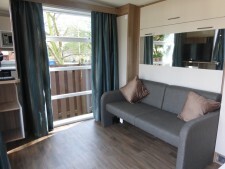 New for this year is the Swan Suite - a self contained unit for two people, with kitchen and toilet facilities, bed sitting room, and large patio overlooking the caravan park. Ideal for a romantic weekend away, or even just a night off. ALL ENQUIRIES SHOULD BE MADE TO 01668 213362 or 07703335430. You can also e-mail us at corillas@icloud.com or message us on Facebook: Bluebell Farm Caravan Park and Holiday Cottages. Bluebell Farm enjoys a quiet central location in the village of Belford. The A1 by-passes the village approximately one mile to the east, ensuring undisturbed peace combined with ready access to the main road linking Newcastle and Edinburgh. Midway between the historic towns of Alnwick to the south, and Berwick-upon-Tweed to the north, Belford was a stopping-off point in the days of the London to Edinburgh Mail Coaches. The Blue Bell Hotel, an old coaching inn, still overlooks the Market Square. Shops and pubs are all within easy walking distance, and there are good transport links to places further afield - the main east coast railway runs through Berwick, there are airports at Newcastle and Edinburgh, and a ferry service out of Newcastle to the continent. We are conveniently situated for some good walking and cycling routes (St. Cuthbert's Way, St. Oswalds's Way, the Coast and Castles route), providing a warm welcome to all who are passing through, or staying for a while. We are only 5 miles from Bamburgh with its wonderful beaches, 8 miles from the Holy Island of Lindisfarne, and 8 miles from Wooler, the gateway to the Cheviots and the Northumberland National Park. Bowden Doors and Kyloe Crag are very popular with climbers, and lie just minutes to the west. The historic Scottish Borders are only a few miles away, and there is a wealth of outdoor activities on offer in the area, including golf, riding, canoeing, cycling, diving and walking. The region is rich in history with many significant National Trust and English Heritage sites to visit, as well as a number of fine country houses and castles still in private ownership. Castles at Alnwick, Bamburgh and Chillingham have provided the backdrop to many films, Manderston hosted the Edwardian Country House series on Channel 4, and Hadrian's Wall managed a cameo part in "Robin Hood, Prince of Thieves". More recently, you may have seen some of the programmes on Northumberland presented by Robson Green, "Tales from Northumberland" and "More Tales from Northumberland", in which case you will already know what a magnificent county Northumberland is, and how much it has to offer! Click on "Links" to see just some of the attractions easily accessible from Belford, including the much acclaimed Dark Skies Experience at Kielder, the Farne Island boat tours operated from Seahouses, and much more. Belford is a thriving community and there are a number of events which have taken place here in the past or which have become regular attractions - fireworks at New Year, Belford Village Show, a permanent local history exhibition, etc. Details of events are displayed on the Belford Village webpage, www.belfordvillage.co.uk as well as links to local facilities and attractions. 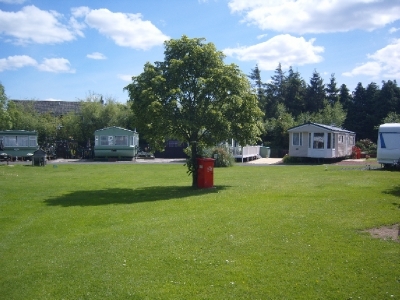 Situated in the heart of North Northumberland, just off the main A1 road, halfway between Alnwick and Berwick upon Tweed, and just 5 miles from the spectacular beaches at Bamburgh, Bluebell Farm offers a range of self catering holiday options: the Caravan Park has bases for 40 static caravans and 22 seasonal touring caravans, with a small area for tents and occasional touring units. New this year is our one man wooden tent - wind and waterproof, with gas camping stove, this is available for hire by the night. Bring your own sleeping bag or hire from us. We also have a Bunkbarn, offering hostel style accommodation with a self contained Studio annexe, the Ark, and 5 self catering cottages, giving a wide range of choice for self catering holidays in North Northumberland.